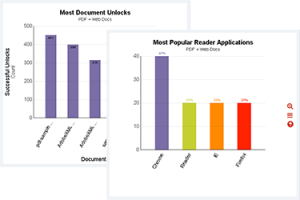 [PRWeb | Vancouver, BC, March 29, 2016] Vitrium announced today that the latest release of its document security solution, Protectedpdf version 6.0 includes new document analytics features and increased compatibility with read-out-loud applications for the visually impaired.Those who distribute PDF-based content, such as training materials, research reports, financial documents, manuscripts, eBooks, and more, can start leveraging these features to improve their end user (or reader) engagement while still ensuring that their documents are protected against unauthorized access and file sharing. Content publishers will be able to monitor the performance of their documents with detailed, real-time data, and use these metrics to improve the effectiveness of their content. Through document-level and page-level statistics such as document unlocks, reader count, reading time, and read through rate, content publishers will have a better understanding of reader behavior and be able to optimize their content for a better reading experience. They will also discover who their most active readers are, what applications or browsers are used, and where their readers are located to ensure that their content is reaching the right target audience. The new analytics dashboard in Protectedpdf allows administrators to view a graphical representation of the key document and reader metrics in one place for a specific time period, with drill-down capability to view more comprehensive data in the reports tab. Administrators can even export the data from selected reports to a spreadsheet in comma-delimited, or CSV format for further analysis and reporting. – Susan Daly, President & CEO, Vitrium Systems Inc. Along with the new analytics features, the latest version of Protectedpdf includes improved accessibility for readers. Vitrium’s HTML5-based document web viewer, that converts PDF files to a secured format for viewing on all modern web browsers including mobile devices, now has better compatibility with screen readers and other read out loud applications for the visually impaired. This lets content owners preserve their revenues by distributing their training materials or other PDF-based educational content to all their readers, knowing that they will all enjoy equal access to their content.